Meetings at work take up some serious amount of time nowadays. That is why they tend to be time and energy consuming but attendance is a must, but not only physical attendance is required. You must be productive and efficient at those meetings as well. One thing that nobody wants to experience is time wasted in those ineffective meetings where nothing has been achieved; instead, the winning situation is where a lot has been achieved in a short amount of time. Here is how to plan and achieve productivity during these team collaboration meetings along with some help from Forbes on how to have meetings that are more productive. Meetings are time consuming indeed, so, in that context you need to consider your employees’ schedules as a meeting held at the wrong time can overload them and decrease their productivity when working on a certain project. According to some researches, the best timing for a meeting is 3 p.m. on Tuesdays. That is the time when all employees are almost finished for the day, but considering the week it is early so that it doesn’t depend on deadlines. Always have an agenda for the meeting planned in detail and try to imagine how it is going to run. Even if it is a cloud all-hands meeting through a platform like BlueJeans, develop the agenda carefully and don’t forget to assign time for questions. Go through the points in the agenda and assign time planned for each one. That way you will make sure all the attendants are familiar with what about the meeting is. Make it a rule that skipping a point of the agenda is possible, but not adding a new one. That will all cost valuable time. This way you will not only keep everyone happy, but also looking forward to the meetings where everyone participates and it all gets solved extremely fast. A regular duration of a meeting is an hour, instead, keep them under 45 minutes, that way you will see that everyone is happy and things get solved easily in a fast manner. 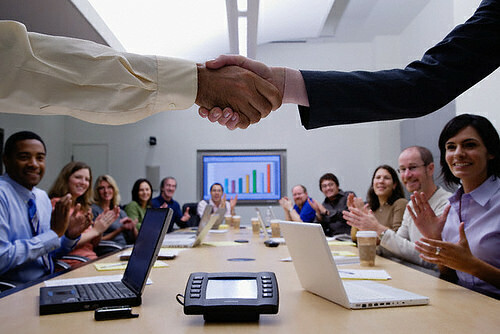 Big corporations assign their successful meetings to the fact that everybody present has a certain responsibility. Everybody is held accountable on a certain agenda point and that makes everybody participate head on. In case there is not enough points on the agenda, apply a rule where everyone should report on their task or project accomplishments. The smaller the meeting group is, the more productive that meeting gets. Instead large gatherings where no one gets a chance to express him or herself, opt for smaller meetings where people can actually actively participate in exchanging ideas. It will get the best out of every meeting held. When having a small meeting you can always consider doing it outside the company’s premises. That way the attendants will be more relaxed and up for an open discussion on certain matters. Sometimes, the conference rooms and offices can be suffocating and not getting the best out of people. This way you will keep your meeting casual, yet it will get the job done and much better than a regular meeting indoors. Make sure everyone shows up for the meeting on time. If coming late, they will create all sorts of distractions and protest among the others present. Set up a strict attendance policy where everyone will face consequences or rewards for attendance in a timely manner. Don’t be too harsh with the consequences and don’t be too rewarding. It is something to make everyone come on time for the meeting. At the end of each meeting, make sure to ask the attendants to share their opinion on the matter at hand or recap what the meeting was about in their eyes. Ask them some questions to get a clear picture of how much they understood. As said before, meetings can be very time consuming. However, make sure you stop that by setting a specific time when the meeting starts and ends. This way you won’t stray from the time planned and you won’t waste your and everyone else’s valuable time. This will allow you to keep track of the time spent and it will make sure that no time is wasted on elongated discussions and chatter. At the very end, for meetings to be productive, they need to be well planned and goal oriented. Get the right people to participate at the right meetings and that way you will bring all the necessary discussions to a minimum. By valuing your time, you value all the others’ and you improve their productivity as much as possible. According to Entrepreneur, you should get familiar with the rules of holding a productive meeting and apply them to your agendas, that way you will get the best out of every meeting.